And how about for filler injections? Are there different levels of expertise in treating different areas? Filler injections also have this kind of hierarchy of possible complications. If we just review briefly where the fillers are used commonly, and then we can kind of discuss which is the most elementary to the advanced techniques. So basically, the lips are able to be augmented with a filler, the nasolabial lines are able to be corrected with a filler, the marionette lines which are lines extending from the corners of the mouth inferiorly towards the chin are able to be corrected somewhat with a filler. You can also correct what we refer to as a tear trough, and those are depressions underneath the eye located under the orbit. And you can, in addition to those areas, you can treat, as I mentioned earlier, the glabella in combination with Botox. So those are kind of the most common areas that are treated. I would say that the easies and the quickest filler area to learn is the nasolabial fold. And, it's very forgiving area so you can right away notice the difference when you lie down a line of filler down in that area, and you can see if you need more or less. And there's really no complications in that area that are commonly seen. I mean I get, ocassionally, someone will have bruising. The next area that I'd say would probably be more of the easier to correct would be the marionette lines. I always look in the mirror and that line is a smaller version of a nasolabial fold. Actually, that's similar with you know, placing threads adjacent to the fold and building up a platform, and then again very forgiving with regard to treatment. Slightly more difficult area to treat and really only because patient's expectations appear to be a little more demanding in this area. It tends to be perhaps a younger age that is wanting their lips augmented. And you're usually starting with lips that typically appear very nice to begin with. They just want a little more volume. So it's easy to actually make them look perhaps not as good as they did before they came into your office. Your lip augmentation needs to be a little more finessed. You need to be a little more attentive to exactly how much volume you're adding because if you add a little too much volume to one side, it could possibly result to a patient being dissatisfied with the treatment. So I'd say that's a little more difficult. The tear troughs and the glabella are what I consider some advanced techniques. The glabella I consider an advanced technique only because it's crucial and critical to understand the potential risks in that area. And the potential risk in that area is skin necrosis resulting from inadvertent injection of blood vessels. So if you were to go too deep in that area, and perhaps inject a portion of your product into a blood vessel, you can potentially necrose the overlying skin. So you must make sure that when you inject that area, your needle is in the dermis and not below it, in the subcutaneous tissue, where there's a risk of injecting a blood vessel, resulting in the necrosis of the overlying skin. The tear troughs, I consider a more advanced technique because the skin there is so thin that if you are not at the appropriate depth of injection, your product will be visible under the skin. And occasionally, that product discoloration can be blue or purple in color. So you must make sure that when you're placing your product that's really deep,and I actually put it right in to the bone. So it takes a little more understanding that the local anatomy clearly or near the eyes so you wanna make sure you're well away from the eye itself and you're right on the bone or the orbit. So that's how I'd wrap up the fillers, you know, the nasolabial folds. Everybody should be able to master that pretty rapidly, then move to the marionette lines onto the lips and then the glabella and the tear troughs. So you brought up a couple interesting things which are basically undesirable results, like injecting Botox around the mouth and drooling is probably not making patients very happy. Are there clinical indications that you have that would make you steer clear of a treatment that was asked for by a patient? Yeah. I mean the most basic reason for me to stay clear of a treatment is if I feel that the client does not understand what I'm able to accomplish with my products. So if I feel that there's unrealistic expectations and I think that's something that you learn with experience but also if you..right out of the box if you continue to hear that it's very important to make sure you understand somebody's expectations and always keep that in mind, I think that you will not have clients that are unhappy. As far as some anatomical difference in somebody, I mean, there really aren't anything like that that will prevent me from using a product. I mean clearly, you know, there are contraindications to some of the products. I mean for instances, Botox , neuromuscular disorders are contraindicated. If you have a history of anaphylaxis, you know, those situations are going to prevent you from using it. But as far as why I would not perform a certain procedure on a given patient, it's only because I feel that they're not going to appreciate the limitations of the product and they're going to be unhappy. Now, I wasn't actually referring to anatomical differences. What I meant was if a patient comes in and they have heard you can inject smoker's lines around the mouth with Botox and you know get a good result, are there things that you have in your experience kind of come across a patient has wanted that might even be kind of in the scope of possible treatments but you have steer cleared with? I guess it comes down with managing a patient's expectations. Are there things patients have wanted that you have not done? Yeah. If I have a good relationship with a patient and I feel we're on the same page, I will try to correct any depression or any wrinkle with the products, because if you understand the mechanism of action of the products and if you understand the etiology of ageing, then you can pair those 2 together and correct anything. I'll give you a couple examples. I have a couple of patients I have been seeing for years who have very, very shallow depressions on their nose, on their nasal dorsum almost imperceptible to me. But there is a slight depression and it bothers them. And I have a very good gut feeling from both of these clients before I injected their nose with a filler. Not because I was worried about an adverse reaction there but simply because it's a filler and we're placing it in a subcutaneous tissue there. I'm aware of their anatomy there. There's no vessel that I'm going to damage. But I am aware that if they didn't understand the limitations of the products, then I may potentially not be able to improve that shallow groove, they would be unhappy. But I do it and I do it repetitively to them and they're happy. I have another lady that has these awkward, strange appearing depressions on her cheeks not in the usual distribution and I really had never seen anything written to describe on how to fill these lines on the cheeks but she really wanted them filled. So we talked about it several times before I agreed to do it and she's happy with it and I'm happy with it. But if I think that if someone believes in their mind that I'm going to be able to take a paintbrush and just paint over these lines and they're going to look like they did when they were a teenager then I'm not going to be doing that procedure. So let's talk a little bit here about fillers. 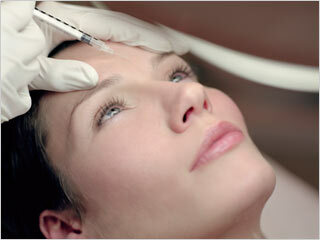 I know that there are physicians who have better results with fillers than other physicians. I think that one of the things that makes a better injector is that their aesthetic sense is better. They're looking at what the understanding of the effect of beauty is. And so they're not overfilling the lips and they're not filling them with the same amounts. What's been your experience with that type of treatment on the side of the physicians? Have you seen physicians who are doing, in a sense performing like the exact same treatment and having better results? Well, clearly, there's going to be a difference between injectors and the results that they're getting. But I mean, in general, most people that have accumulated a bit of experience and they've read about it and they attended a course or 2 and they thought about it, most of us are getting nice results. I think there are some people that perhaps are not paying attention to the normal indications for products and what they can accomplish. For instance, typically with ageing, we develop some jowls or the accumulation of tissue along the jaw line. Now when that varies light, you could add a little filler to the area adjacent to it and improve that. But if there's a lot of jowling, you know, an extensive amount of ageing, really, the amount of filler required to improve that would just not be realistic so maybe you wouldn't get a nice result there. I think it's important for providers to understand exactly what can be accomplished with your products. I mean, certainly with anything, some people may be not as attentive to detail as others but like I mentioned, I think that most of us who have done it and paid attention and thought about it, don't necessarily need believe you to be an artist as what I'm saying to do this but I think you have to appreciate how you age, take your time, appreciate the limitations of the product and really make sure that your client is going to understand the results. I find it difficult to compare different providers because it's hard to factor in any variances in anatomy. I mean, everybody's different a little bit. So one lady's to one's whose lips are augmented or another maybe they started with different lips which is usually the case. Maybe one is going to look better with them augmented. I think it's difficult to compare providers personally since the patients are always different.